An Egyptian court’s confirmation of 75 death sentences on Saturday has been condemned by Michelle Bachelet, the UN High Commissioner for Human Rights, as being the result of an unfair trial. Ms. Bachelet expressed her extreme concern at the decision which, if carried out, would amount to “a gross and irreversible miscarriage of justice”. The trial is one outcome of the military crackdown on Muslim-Brotherhood led protests in the Rabaa al-Adawiya and al-Nahda squares in Cairo on 14 August 2013. It is alleged that up to 900 mostly unarmed protesters were killed by members of the Egyptian security forces. The Government later claimed that many protesters had been armed, and that a number of police were killed. Subsequently, charges were brought against a total of 739 people during a mass trial at the Cairo Criminal Court. These charges included murder and incitement to violence, membership of an illegal group, participation in an illegal gathering, and other crimes. In addition to the death sentences, 47 people were sentenced to life imprisonment, while the remainder were handed jail terms of varying length. There have been several mass trials in Egypt, involving hundreds of cases being heard at the same time, and raising many of the same issues about due process and fair trial standards. “The conduct of the trial in the Cairo Criminal Court has been widely criticised,” Bachelet said. “And rightly so. The 739 people were tried en masse, and were not permitted individual legal representation before the court. In addition, the accused were not given the right to present evidence in their defence, and the prosecution did not provide sufficient evidence to prove individual guilt. The evident disregard of basic rights of the accused places the guilt of all those convicted in serious doubt. I hope that the Egyptian Court of Appeal will review this verdict and ensure that international standards of justice are respected by setting it aside,”. Ms. Bachelet also pointed to the stark contrast between Egypt’s mass trials and a recent law that effectively grants members of the security forces complete immunity for crimes they may have committed. In July this year, the Egyptian Parliament approved a law that will effectively bestow immunity from prosecution on security force personnel for any offences committed in the course of duty between 3 July 2013 – the date the military overthrew the Government of President Morsi – and 10 January 2016. 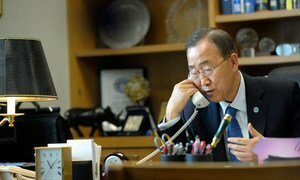 Secretary-General Ban Ki-moon today expressed his profound concern about the direction in which the transition in Egypt is moving and reiterated his strong condemnation of the upsurge of violence that has led to scores of people killed and hundreds others injured. 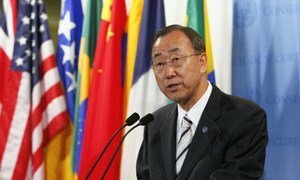 Secretary-General Ban Ki-moon today strongly condemned the deadly upsurge of violence in Egypt and called on security forces to respect the right to free speech and assembly while urging protesters to demonstrate peacefully.